The Allday PrimeTime Web Time Attendance System. Connects to Web Hosted software . The hassle free modern software solution. PrimeTime Web is an affordable modern and complete time and attendance system. Allowing you to accurately record the attendance records of your staff and giving you easy to access data at your fingertips where ever you are. Access the system dashboard via any web connected device from where ever and whenever you need to. The system comes with full built in helpdesk live chat support at no additional cost so you will not be on your own. The system grows with you, Add further terminals to expand the system as your company grows. Upgrade the System to Allday Time Manager Professional for even more features. The system is designed for easy quick setup with mail order hardware, an integrated clocking app Absence bookings and self service Rotas and shifts. and is fully documented user guides. Reliable biometric technology ensures that employees have to be present to clock in. No more costly buddy-punching. and if they use the mobile app you will get a geo location shown on google maps where they were when the clocked IN or OUT. Need a Profesionalay installed option ? then look at our Allday Time Manager Lite or Professional systems which are available fully installed options. 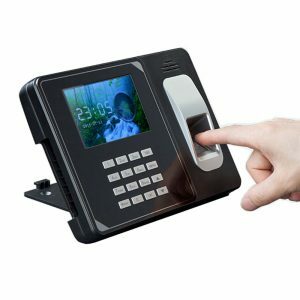 The PrimeTime Biometric system offers a variety of communications options for connecting one or more terminals to your PC or network. Each employee can be enrolled at one or more terminals and you can change terminal assignments as required at any time. It’s easy! Enroll the employee’s fingerprint or id card at the terminal, at as many terminals as you’d like. This means employees can clock in at one terminal and clock out at another — no more having to walk to the other end of the building just to clock in or out. If you need further assistance, call us on 01252 544457 we will be happy to help. We also offer 30 days trial of many of the software elements should you want to try before you buy Allday Time also offers free live chat, email or telephone support to help you get started right, and convenient and to insure you keep running smoothly!